I made these cross blocks a while ago and they've been sitting on my design wall ever since. The pieces for them came from this drawer of strips, which I cut some time early in the year. I had a plan for some scrap blocks, scribbled on a Post-it note, and I cut up metres of stash fabric into these size strips. Then I forgot all about them. And lost the Post-it note. 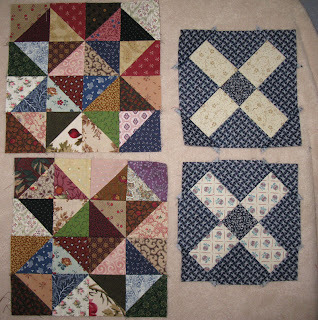 I thought these cross blocks were what I was making, but there weren't any more pieces or strips this size. Hmmm. This weekend I decided to deal with the whole mess by figuring out what exactly I'd been trying to make in the first place. The 5 1/2" strips were easy; cut into squares and cross cut again they made these triangles, and I'd already cut a heap of them and put them in the drawer. There were also many 3 1/2" strips, and they fitted the short side of the triangles, so they must have been for the arms of the cross; but how wide was I going to cut them? 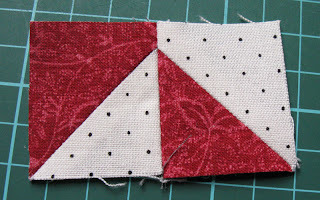 There were also a heap of 2 3/8" strips, some cut into squares and then diagonally for corner triangles. Obviously whatever size cross fitted them would be the one that I intended to make. I made three samples, one with the cross arms cut at 2", one at 2 1/2" and one at 3". The corner trianlge for the 3" one was toooooo small. The corner for the 2" one was tooooo big. But the 2 1/2" one was juuust right! So now I've cut the strips up into the correct pieces and have sorted them out into blocks and they can be my next leader enders. Or not. 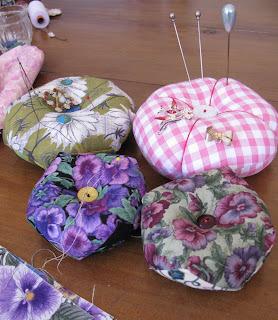 They are so much fun to sew that I've done about 12 of them without stopping. 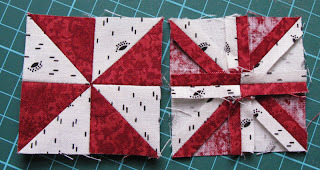 And while I do like the thicker cross in these blocks I also love that thinner one. Might have to make a heap of them as well. And I have written up all the sizes and diagrams in a book, so that I won't get lost again. Not on this project anyway. We made a quick trip to Adelaide last week, and left very early in the morning. 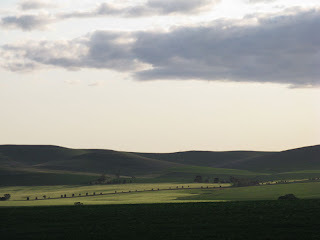 The countryside was so beautiful, it made me wish that I was up early every day. But I'm in night-owl mode at the moment, staying up past midnight knitting and working on projects, so I usually miss out on the early times of the day. But you can't have it all, and I do love staying up. We picked up another Ebay purchase, a lovely little Singer 185; Mereth is terribly jealous because it's green, and hers is brown. These don't come up for auction very often, so I sort of Had to buy it when I saw it. It needs some TLC; it's very neglected. It was jammed solid with thread, but half an hour of painstaking tweaking saw that all removed, so that it at least turns over. I need to drastically over oil it, as it's very dry, and then clean it up before I sew a test piece. Her name is Nell Green, and I think she'll like it here with all the others. 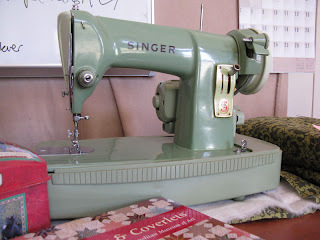 I also found a Featherweight 221, that sews a beautiful seam. No pictures, because she looks like my other one, nothing special. 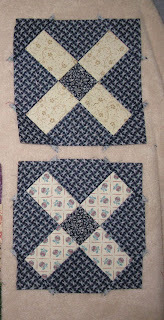 When I've sewn a block on her I'll post a piccie.. 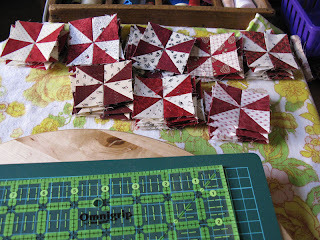 I spent the weekend pottering in my sewing room and tidying up baskets of bits, and cutting for my pinwheel quilt. I thought I'd made an improvement, until Mereth came round on Sunday. She chatted to me while I cut more strips, and without any seeming effort on her part restored perfect order to my strip containers. She has this genius for organsiation that I seem to be lacking; maybe she got my share of it as well. I shall have to invite her round more often! 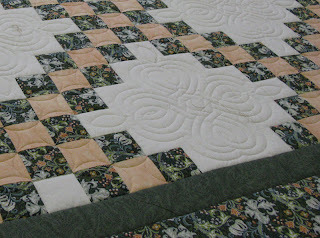 This is the Double Irish Chain that I spent days quilting. It still hasn't been collected, and I'm quite fond of it. I may just have to piece one of my own soon. Clicking on the picture should give you a better look at the detail. 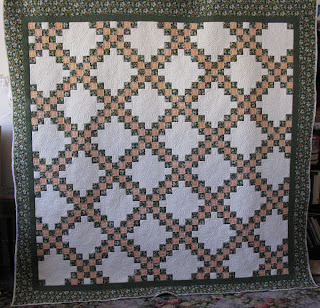 I like the Continuous Curve quilting in the small squares, and it was fun to come up with the interlocking design for the large spaces. Our whiteboard is covered with even more ambitious scribbles, and I will have to photograph them so that later we can develop them into designs. In the meantime, we need our whiteboard back. 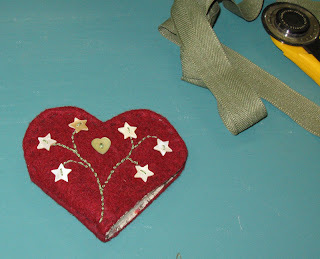 This is the little felt needlebook I made on the weekend. 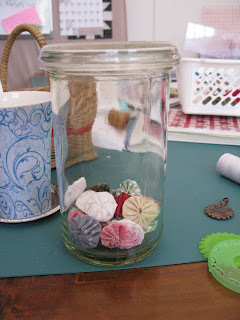 I've had the mother-of-pearl star buttons for many years, and they were just right for this little project that I will use every day. The felt pages inside are a bit rough and ready, I intend replacing them with some wool blanketing, when I find where I put it. I know it's here somewhere. 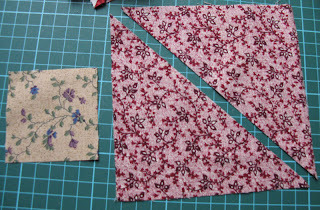 I'm on to apron number 6 now, all basic patterns that take up about 1 metre of fabric. Our lovely dress form Matilda is modeling one of the creations in a vintage check fabric that was only 34" wide. It's nice being able to use our vintage material for something really useful. Mereth loves the 3 pockets at waist level, and hopefully we will learn to place pins in the apron bibs, instead of our clothes, where they end up in the laundry or bathroom, or even worse, the washing machine. It was a day of backing fabric, huge lengths that had to be washed and ironed and squared up ready for loading on Millhouse. It seems like every surface in the workroom is buried under acres of fabric. 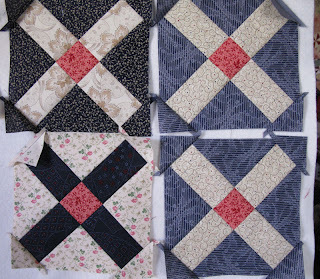 We aim to have 4 quilts finished by the end of the week, so hopefully we'll have some room to move. We're just tidying up the thread ends on a Double Irish Chain, and when the lighting is right tomorrow we'll take some photos. It turned out just the way we wanted it to, and I hope the customer is as thrilled as we are. 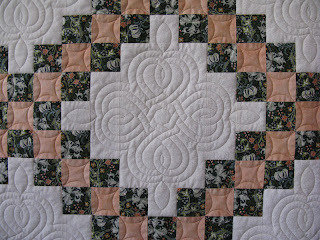 She did a fantastic job piecing it, and it was fun to design celtic patterns for the border and blocks. I would have this quilt as my own in a heartbeat. 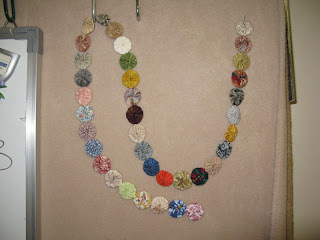 See this chain of yo-yos hanging on our pin-up board? 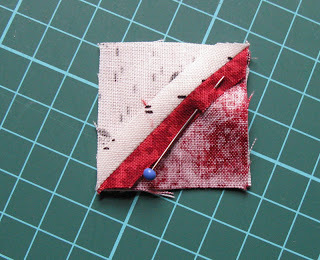 I'm making a yo-yo from the backing fabric of every quilt that we have quilted on Millhouse. We have scraps of nearly all of them, and I'm really enjoying making this tangible reminder of our work. I plan to have a folksy Christmas tree in the workroom this year, and it will be decorated with this garland and lots of homemade fabric ornaments. I hope one day to have many of these garlands on our tree. 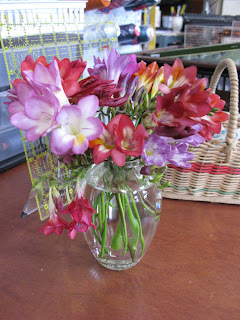 Mereth arrived this morning with a bunch of freesias from her garden; lovely flowers, and sweetly fragrant. Spring has arrived. 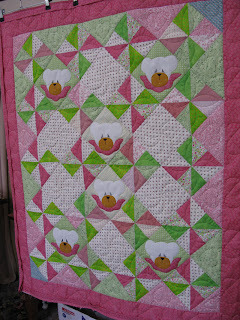 These first two photos are two crib quilts we finished recently. The Dresden Plate was done in '30s reproductions, and it was very sweet. It had to be finished without delay, as the baby was due to arrive any day! 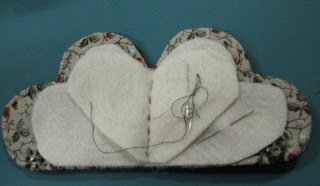 The bear applique was very sweet and pretty, we thoroughly enjoyed working on it. The maker of these two tops has now completed a quilt for each of her six great-grandchildren, no small feat. They were fun to make and they look wonderful; I made them with 5"charm squares, and I will make a few more through the week. I also made a needlebook, but I left it round at Mereth's, so you can't see it just yet. Next on the sewing list is aprons, at least 10. 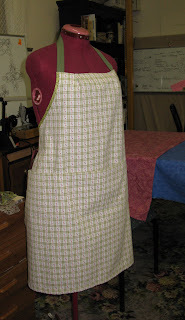 Mereth and I decided we need to wear aprons in the workroom, especially as a lot of the quilts we've been working on are stitcheries or white-on-white fabric. So I need to whip up enough aprons for both of us. That will be a fantastic stash-busting exercise! 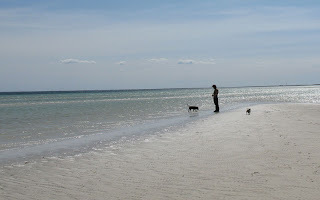 Last weekend we had to go shopping for a client's quilt, and combined it with a trip to the beach. Moonta Bay is about an hour and a half south of here, and is a lovely little tourist town. 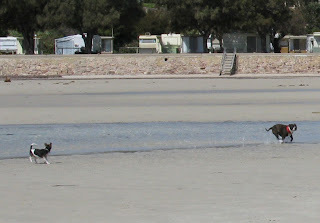 The beach has acres of sand, and Macca was delighted by it all. It was his first time at the beach, and the expression on his face when he had a drink of sea-water was priceless. 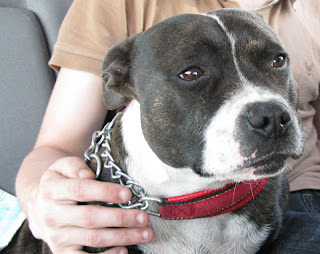 Jessie never stopped running the whole time, except when she was digging through the drifts of seaweed. I was relieved she didn't find anything disgusting, despite her best efforts. For some time now I've been harping on to Mereth about an idea I had. Remember that old TV show, Queen For A Day? My idea was that I would let Mereth be QFAD, and I would sew whatever she wanted me too, I would tidy up sewing rooms or cut new kits or iron fabric or sew boring old bits together, in short whatever she wanted me to do. In return, I would get to be QFAD, and I already had my project picked out. 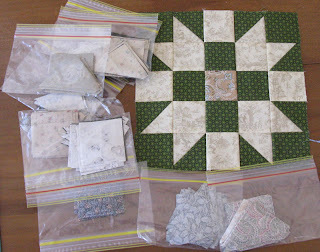 My 4 drawers of green fabrics are a constant reproach, and I want a Sisters Choice quilt; so I want her to help me make a green Sisters Choice. Simple. But she's not convinced. She doesn't need me to cut fabric, or sew blocks, or tidy up. And she doesn't trust me to be accurate enough, and I'm too messy to be allowed in her sewing room, and if I sewed on a project then she would miss out on the fun of making those blocks.... And she says I'm a control freak! Hmmpphh. But I have been building up Brownie points here and there, quilting customer quilts, working out patterns for her, ironing backings and doing paperwork. And at last it paid off, when she agreed to help kit up 30 Sisters Choice blocks in exchange for some Creative Studio work that she didn't want to do. WIN!! N0w I just have to sew them up, but that will be pure fun. I didn't get to be Queen For A Day, more like Princess For An Hour, but it was fun while it lasted. 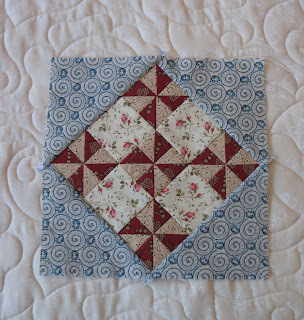 My pinwheel blocks are made of 1.5" HST, meaning they are a 2.5" unit, finished size 2". 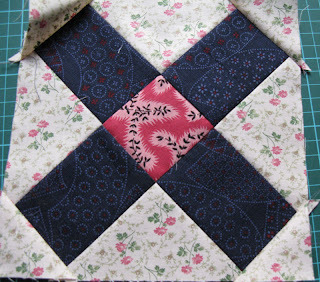 The centre part of the block is 6" finished; 5 pinwheel blocks and four 2.5"(cut size) squares. 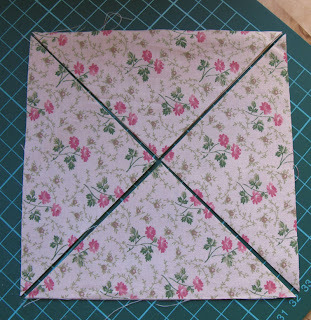 The large triangles are made from 5.25" squares, cut once diagonally. 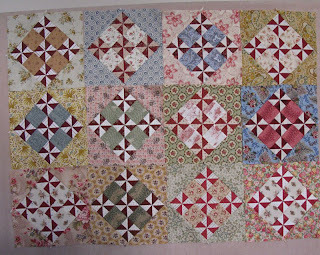 the final block measures 9", 8.5"finished size. 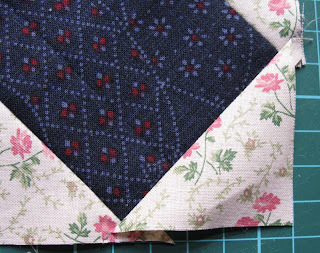 I press all the seams of the pinwheels open, to distribute the bulk of the seam allowances better. 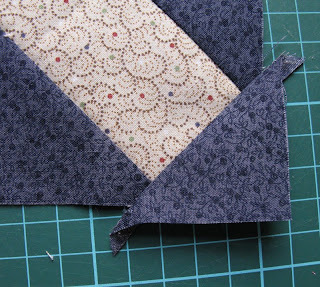 The rest of the block is pressed the conventional way, seams to one side. 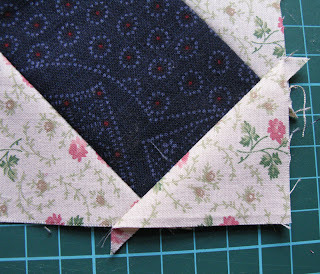 I pin the little HSTs together at every stage too, because I'm in the mood to be particular with this quilt. I like seeing that all the seams meet exactly; if they don't I just shrug and accept it, but I try for perfect every time. That's what all the pins are for. 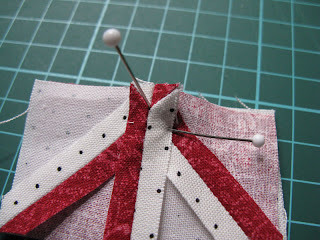 When it comes time for that last seam I line up the points that I want to meet and place a pin through them and jockey them into position; then I use another pin to hold them in that place while I sew. The vertical pin is removed as soon as that other one is in position. I found my top intersections were consisently pushed past the bottom, so now I lean that first pin slightly to the left before placing that final one and the finished block is more accurate. I have been a bit frivolous the last few days, spending my spare time making yo-yos. I saw a jar of yo-yos on a blog and thought that I'd like my own jar full. 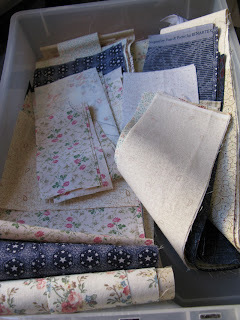 It's a valid Stashbusting exercise; I went through some of the stash drawers and weeded out the fabric that is too thin for regular patchwork, and I've cleared out several FQs and scraps already. I'm using the small Clover yo-yo maker, and it's very simple to do. I have a few more hours of work ahead of me before that jar is full, but that's OK. I plan to work on them when our night applique group meets, and I can sew and chat without paying too much attention to what I'm doing. 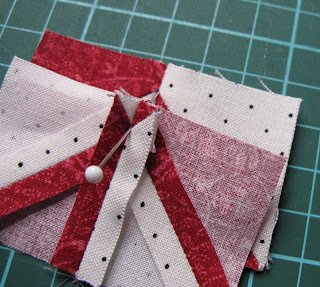 I have a vague notion of making red and white garlands for Christmas decorating, and these little beauties would look great strung together, with maybe a button or two for embellishment. 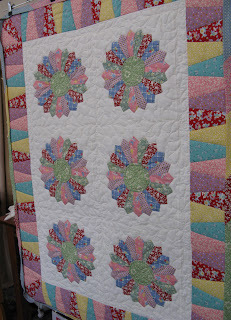 I spent the weekend sewing more tiny pinwheels, enough for another 14 blocks. Incidentally, I'm rather impressed with the Omnigrip ruler I recently bought; the markings show up really well and it seems very stable when cutting. I might invest in a few of their other rulers, there's a 4" x 14" one that looks useful. I just love rulers and gadgets, obviously. I still adore this pattern, which is good, because I need a lot more blocks. I have 12 done, and I'm loving every bit of it. 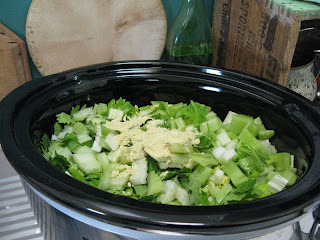 It's going to be Pretty, with a capitol P. Recently I've been giving the crockpot a workout. In the morning I chop up enough veggies to fill it up, throw in some chicken stock powder and water, and by lunchtime we have soup ready. Today was celery soup, and tomorrow we're having pumpkin; it's wonderful to have our lunch ready after a morning hard at work, quilting.